Here at The Trunki Files, we are huge fans of Lanzarote. Under four hours’ flight away, no time difference, great beaches, kiddie-safe resorts and year-round sun, it ticks a lot of our boxes. And whilst it has an over-abundance of good-value apartments and villas, for families wanting a bit of luxury, the Princesa Yaiza in Playa Blanca must be one of the best places to stay on the island. For a hotel, the rooms are set-up brilliantly for families. As standard, you get a one-bed suite. You have a separate bedroom with a huge king-size bed, room for camp beds / cots and masses of wardrobe space; a huge bathroom (always appreciated with kids who need nappies changing); a little kitchenette with fridge and sink cleverly stashed in a cupboard off the hall; a lounge area with two sofas, TV/DVD player and a dining table; and a large terrace with chairs. It really is more like an apartment and gives you much more flexibility than a normal hotel room. You can fix a cup of tea or a snack for the children; plus, because the bedroom is big enough for the children’s beds, you can put the kids to sleep and head into the lounge for an evening movie and bottle of cava. It’s worth noting that the Yaiza also offers 2-bedroom family suites. The disadvantage of these is that they’re in a separate building, accessed via a tunnel (that goes under a road) – so they are a bit more of a trek from the pool and the restaurants. I can’t personally vouch for these but they’re worth checking out if you have older children and you need a bit more space (plus they come with a PlayStation)! The final thing to mention on the accommodation is the cleaning. You get daily maid service plus evening turn-down. I have to say I’m a sucker for turn-down and loved coming back in after dinner to sand-free floors, folded towels and a chocolate on my pillow! (Leo was partial to the chocolate too). Breakfast at the Yaiza is worthy of special mention. It, quite simply, is the best breakfast buffet we’ve ever had. The choice of everything is incredible – cooked, cereals, pastries, fruit, breads. Best of all, they have plates of jamon iberico, which normally costs a fortune. We got through about £50-worth of ham each morning. I’d go back for the breakfasts alone. The Yaiza prides itself on catering for children and it does go the extra mile. Alongside the usual children’s pools and babysitting service, there is a great little soft play area which fills an hour or so between beach and dinner. There is also a huge kids club, called ‘Kikoland’. This is actually just off the main hotel grounds, across a path, which is a bit off-putting but it is perfectly safe (there is a thorough registration process). We never actually left our children there – we didn’t feel the need (Genevieve was just 3 months old and Leo was still a bit young); but we did visit to use the facilities and they were happy for parents to hang around and supervise their children. For Mum and Dad, the Yaiza has an impressive spa, nay, ‘Thalassotherapy Centre’. We had a couple of complimentary passes courtesy of our tour operator, so took it in turns to be blasted by water jets whilst the other looked after the kids. Certainly invigorating. 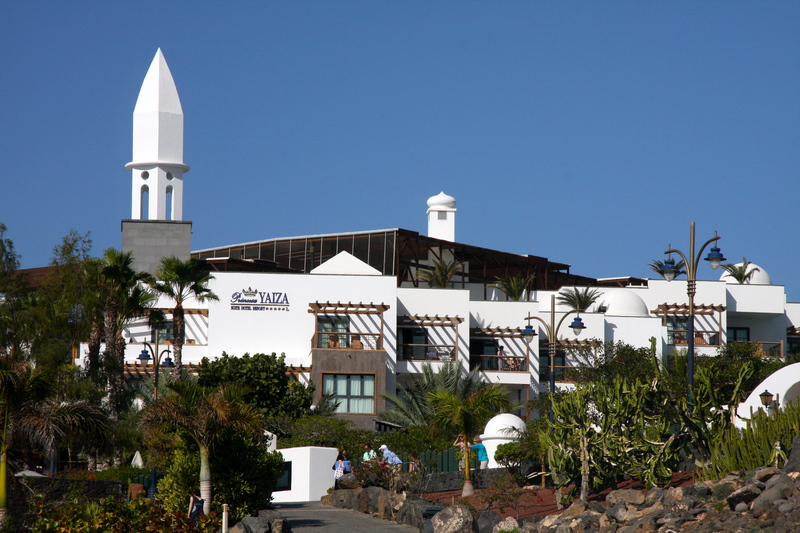 Playa Blanca is the best resort on the island for families; and the Princesa Yaiza has the best location in the resort – right behind Playa Flamingo, the main sandy beach; a 5 minute walk in one direction to the centre of the ‘old’ village, with its waterfront restaurants; and a 10 minute walk in the other to the swanky new Marina Rubicon. 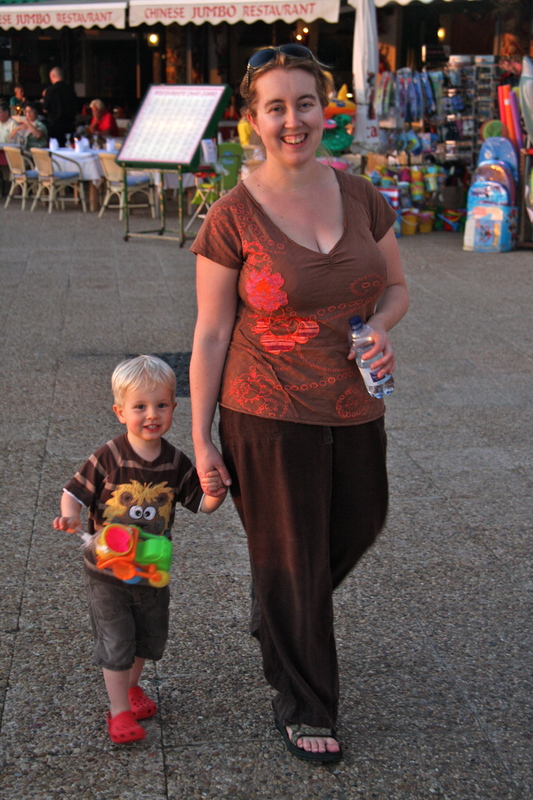 We enjoyed many hours just wandering up and down the traffic-free promenade, making little outings for milkshakes, ice creams, souvenir shopping, boat watching or dinner. By the way, a top recommend for dinner is the Chinese restaurant on the front in the centre – we were eating out for 24 euros all-in and it was tasty stuff! Whilst breakfast was sensational, we weren’t too taken with the dinner options in the hotel. We ate in one of the buffet restaurants on the first night for convenience (late arrival and hungry kids) and it was very expensive – all-in it was over £80 for the four of us to eat. The food, whilst fine, was nothing special and atmosphere was definitely lacking – bright lights and loads of people milling about with half-empty plates. When we realised the next day how close we were to the restaurants of Playa Blanca – and how cheap they were – we never dined in the Yaiza again. That said, we did have lunch in the pizza restaurant there once or twice and it was good, if pricier than outside the gates. The main pool is unheated (or if it was heated, it wasn’t heated very much), so whilst it looks stunning, in the middle of winter it’s really too chilly for swimming. There is a little children’s pool that is warm, which is great. The only problem is that everyone – kids and adults – want in! Whilst the Yaiza is opposite the beach, it does not own it; the beach is public, as are all the facilities. So if you want a lounge/umbrella, you’ll have to pay for it. I think it was about 8-10 Euros a day. Finally, the Yaiza is not cheap. This is a luxury, 5 star hotel with prices to match. That said, keep an eye out for special offers. If you are flexible when you can travel and are looking in the right places, you can get some really good deals (see below). We went in the first week of January, just after the Christmas peak, and paid less than £2,000 a week’s B&B package. We booked our week at the Princesa Yaiza through Sovereign Holidays. I actually came across the hotel in one of their brochures years before, and had ear-marked it for a later date. The Princesa Yaiza is clearly a bestseller for Sovereign and, as such, they get a lot of good deals. Plus they tend to throw in extra titbits like resorts credits, free spa treatments for Mum and Dad and airport lounge passes. If after reading this you are even remotely considering going, I would recommend signing up to their mailing list so you can keep posted with the best offers. Another good thing about Sovereign is that they let you ditch the airport transfers if you want and put the cash towards a hire car. I’d recommend doing this – not that you really need a car, you have pretty much everything you need within walking distance. 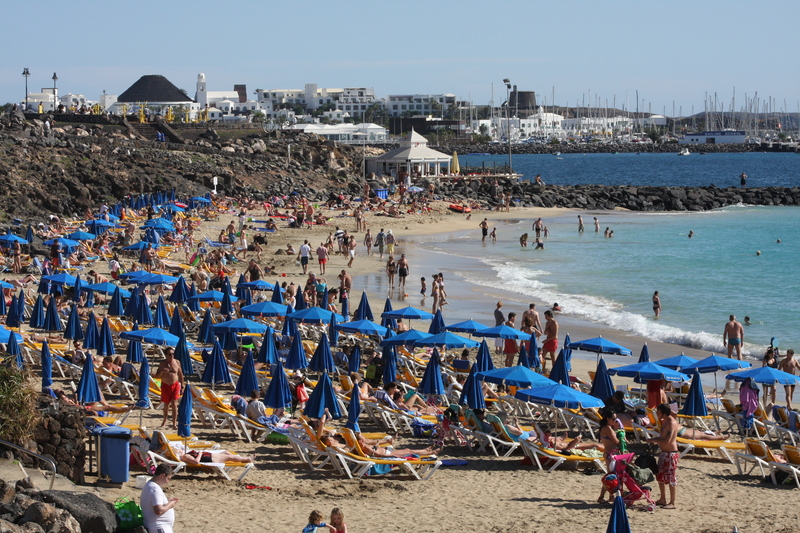 It just gives you more flexibility if you want to explore Lanzarote (which you should) or even hop over to Fuerteventura on the car ferry for a day. Don’t book the car through the tour operator – do it directly through one of the local companies, such as cicar.com. It’ll save you money. We loved the Yaiza. For a luxurious week of winter sun with a newborn and a toddler, it really delivered. We’d go back in a shot; and when we do, we’ll be first in line for a plateful of that jamon. 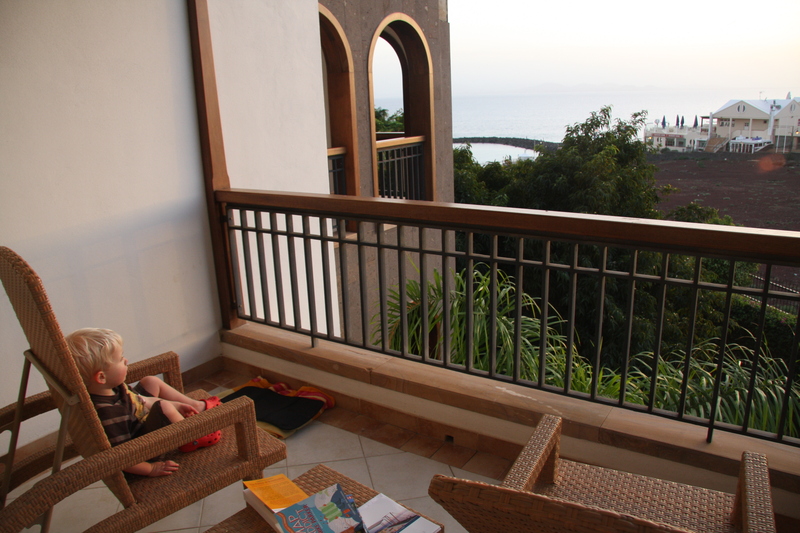 This entry was posted in Accommodation reviews, Europe and tagged lanzarote, Lanzarote holidays, Lanzarote hotels, Lanzarote with kids, Princesa Yaiza. Bookmark the permalink. This is likely to be our November holiday. Had a quote and then checked your site and you’ve been here too. We are following you round the globe! Go for it. We’re headed back to Lanzarote in December, we love it. In a villa this time, but I’d return to the Princesa Yaiza any day, it really delivers.